Dazzling star-shaped flowers and a delicious evening fragrance. Bursting with abundant sprays of white, star-shaped flowers during the day, the flowers exude delicious scent in the evening. Plant in patio pots or flower beds next to windows, entrances or seating areas to enjoy their sweet fragrance. Blooming from early summer, the flowering tobacco plant continues to dazzle right up to the first frosts. A traditional, star-performer that no garden should be without, they're easy to grow and virtually maintenance free. Supplied as 6 top-quality plug plants for potting on and planting out once all risk of frost has passed. A traditional garden favourite, flowering Nicotiana is a star-performer that no garden should be without. 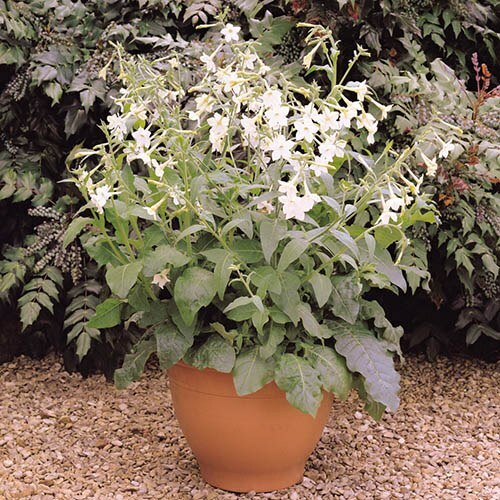 Bursting with abundant sprays of white, star-shaped flowers during the day, the flowering tobacco really comes into its own in the evening when the flowers exude a beautiful perfume, filling the garden with delicious scent. Invaluable in border design where the bright flowers add 'wow-factor' to dull areas and break up blocks of colour in perennial beds, they're also really worth planting in patio pots where they can be placed next to entrances or seating areas to enjoy their sweet fragrance. Blooming from early summer, the flowering tobacco plant continues to dazzle right up to the first frosts, even over-wintering in sheltered, frost-free conditions. Easy to grow and virtually maintenance free, Nicotiana is resistant to many pests and diseases - needing just water and sun! Supplied as 6 x jumbo plug plants, ready to be potted up and grown on. Picking the flowers will encourage lateral growth and prolong flowering. Ideal when grown in a container so they can be moved to wherever you are sitting to enjoy their evening scent. Pot plugs on into a good-quality multipurpose compost and give them cold-weather protection, then once all danger of frost has passed, plant them into their flowering positions. Plant in fertile, moist free-draining soil in full sun to partial shade in a sheltered position and keep well-watered throughout the summer. Once the first flush of blooms is past, deadhead the plant to remove spent flowers and encourage more.